Well, maybe your hands won’t be permanently warm, but at least you won’t be hungry! This bread contains whole wheat flour — if you’re completely adverse to whole wheat flour, you have the option to switch it to regular all-purpose flour. *not shown in the above image. Prep work should take about 20 minutes. Cook time should be about will be about 55 – 60 minutes. This will make 4 servings. Grease the sides of a loaf pan with 1 tablespoon coconut oil. In a bowl, combine your flour and baking soda. In a separate bowl, beat two eggs. Add 1 tablespoon of melted coconut oil to the eggs. Combine your eggs with your flour. Mix until you get a doughy consistency. Take your bananas and smash them into a mushy consistency. (You can do this by taking all of your bananas and placing them in a plastic bag. Then proceed to beat the crap out of the bananas. Great stress reliever if you’re on a losing streak!). 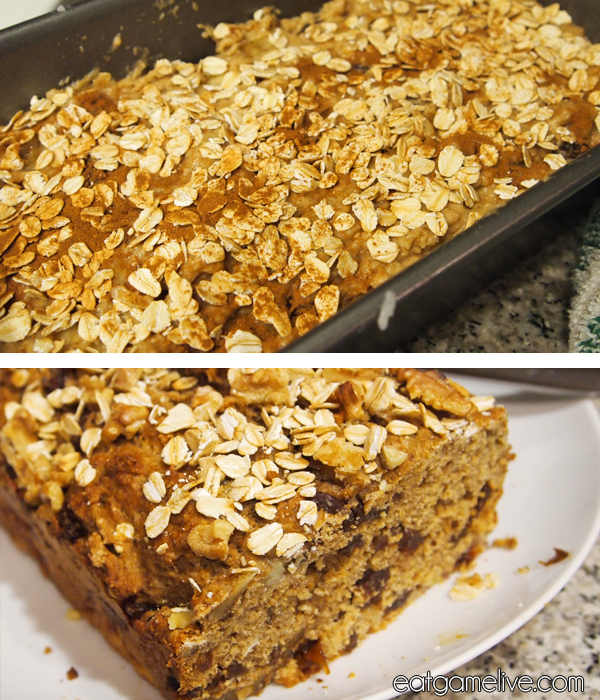 If you want to have banana chunks in your bread, reserve one banana and chop it into small 1/2 inch chunks. Add in your banana mixture slowly to avoid getting lumpy dough. 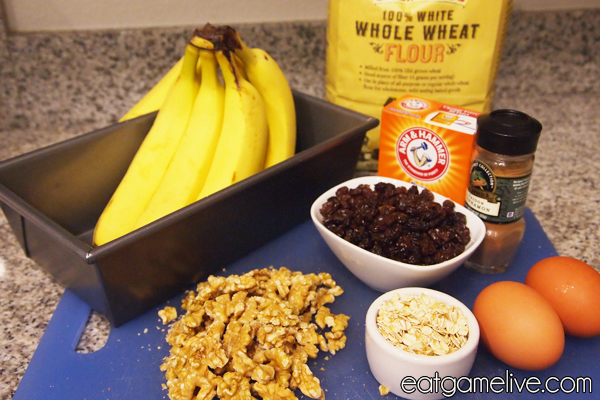 Add in your raisins, walnuts, cinnamon and half of your oats. Pour mixture into your greased baking dish. Sprinkle the remaining oats on top of your bread. Put baking dish in the oven and bake for about 50 – 60 minutes (cooking time will vary depending on your oven). When the bread is finished, remove from oven and let it cool. And that’s a GG WP. 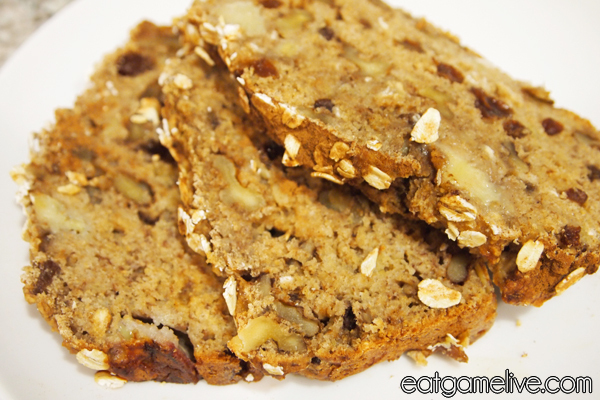 This bread makes a great snack or an easy on-the-go breakfast. Just pop a slice of bread in the microwave for about 15 – 20 seconds and you’re good to go! Now, if you’ll excuse me, I’m going to go hide in a big pile of blankets. This entry was posted in starcraft by admin. Bookmark the permalink. I have to point out my gratitude for your kindness for women who should have assistance with that idea. Your real commitment to getting the message all-around appears to be surprisingly good and has made individuals just like me to realize their targets. The useful recommendations can mean a great deal to me and a whole lot more to my peers. Warm regards; from all of us. Thank you so much for providing individuals with such a pleasant opportunity to read critical reviews from this blog. It is usually very amazing and as well , stuffed with amusement for me personally and my office acquaintances to visit your blog at the very least 3 times a week to read the new tips you have got. And of course, I’m so always satisfied with your attractive things you serve. Some 2 points on this page are in fact the most beneficial we have had.